The Aguila ammunition brand is a Mexico based company that was originated with help from the Remington corporation and has since 1961 gone on to provide some very big armies and law enforcement agencies with ammunition and shooting accessories and specialty munitions. The company offers some very innovative rounds and has for many years provided the Mexican law enforcement and military teams with ammo. This is their plain vanilla .40 S&W load that offers a 180 grain projectile in a flat nosed full metal jacket profile. 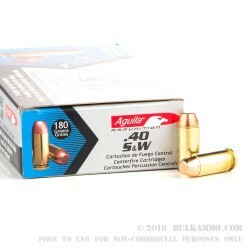 The 50 round box offers a very good price point for range and target practice ammunition and the reliability of Aguila is quite high. 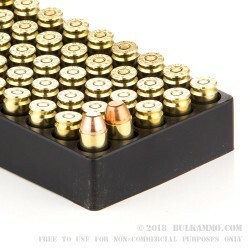 A cartridge casing made of brass with a Boxer primer that is easily reloadable, means the value add is high for this already bargain priced round. 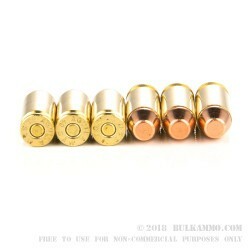 The newly manufactured ammunition offers a price that is relatively competitive with the cheapest range reloads generally and the reliability and consistency in manufacturing is excellent. This is not a specialty round and it isn’t the cleanest shooting ammunition you can find, but it does go bang, and it is very accurate considering the price point is so small. The 180 grain ammunition is slightly milder on recoil compared to other 180 grain FMJ’s but it is not a lightly recoiling round.